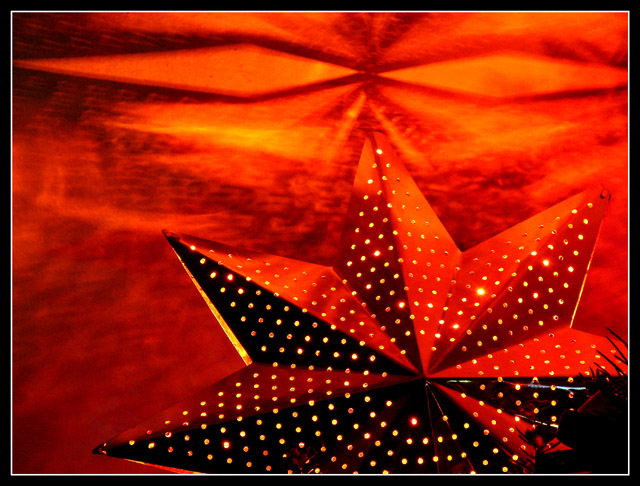 Taken of the star atop my Christmas tree. With all the lights off (except the tree) it created this amazing light pattern on the ceiling. The tree is so big and full, that the star had to be burried in the branches, so that all that is clearly visible are the 4 points seen in this picture. The colours seen are very close to what was on the original shot. Only some sharpening, a little bit of contrast and the border was used to get the final result. I like the composition and colour but I have trouble linking it to the challenge. Proudly hosted by Sargasso Networks. Current Server Time: 04/24/2019 03:51:52 AM EDT.